International Seminar - Forestry and Forest Products Research Institute. REDD Research and Development Center. This seminar is over now. On January 28, 2016, an international seminar on “The Future of REDD+: Interpreting FREL/FRL for Post-2020 Framework” was held in ITO Hall at the University of Tokyo. 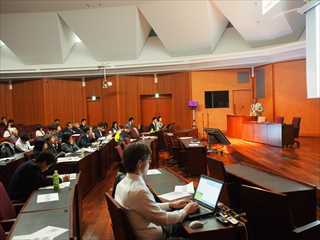 The symposium was organized by the Forestry and Forest Products Research Institute (FFPRI)(Secretariat: REDD Research and Development Center) and co-organized by the Japan International Cooperation Agency (JICA), Japan Public-Private Platform for REDD+, International Tropical Timber Organization (ITTO), and Institute for Global Environmental Strategies (IGES). Under the theme stated above, discussions concerning REDD+ that were carried out over the course of 10 years up until 21st Conference of the Parties (COP21) and the outcomes of these discussions were reviewed, and reports were presented on the progress of REDD+ host countries and their challenges regarding forest reference emissions levels/forest reference levels (FRELs/FRLs) for the post-2020 framework. Additionally, potential solutions for major issues such as establishing relationships between scales and ensuring consistency were discussed, and the international system design for REDD+ from 2020 onward and various issues concerning the improvement of domestic systems were debated. Regarding background to the seminar, Dr. Haruo Sawada, the president FFPRI－the organizer for the seminar－emphasized the significance of REDD+ activities for protecting and strengthening forests as sinks for greenhouse gasses, according to climate change countermeasures outlined in the Paris Agreement adopted at COP21. He also explained the role of the REDD Research and Development Center at FFPRI. He introduced activities of the “Japan Public-Private Platform for REDD+” aimed at promoting REDD+ throughout Japan, and he expressed his appreciation for the related organizations. Next, Deputy Director General Shuji Oki, Forestry Agency of Japan, gave an address on behalf of the invited guests, saying that implementation and support of REDD+ had clearly been positioned in the Paris Agreement following 10 years of international negotiations. He also expressed his expectation that this seminar would provide a forum for sharing outlooks for REDD+ beyond 2020. Lastly, Mitsuo Matsumoto, the director of the REDD Research and Development Center at FFPRI, explained the purpose of the seminar. He clarified FRELs/FRLs for the post-2020 framework－the theme for this seminar－and their meaning not only as benchmarks for evaluating emissions reductions, but also as reflections of a country’s policies and strategies. The primary purpose of this seminar was to discuss the future of REDD+ in anticipation of the post-2020 framework. This included reviewing and examining international negotiation processes thus far related to REDD+, the status of each country’s progress in terms of establishing FRELs/FRLs for this framework and scaling them for the framework from the project level to the national/sub-national level (an important issue for REDD+ going forward). REDD+ was first mentioned in the United Nations Framework Convention on Climate Change (UNFCCC) discussions at the COP6 in 2000 (The Hague), where the role of forests in greenhouse gas (GHG) discharge control measures were discussed. Subsequently, following various discussions and agreements from the Bali Action Plan (COP13) of 2005 to the Paris Agreement (COP21) of 2015, a framework for REDD+ implementation was formulated as a means for carrying out climate change countermeasures. This framework comprised four basic elements: National Forest Monitoring System (NFMS),national FRELs/FRLs, national forest strategies, and Safeguard Information System (SIS). FREL/FRL approaches for the post-2020 framework have been identified as important following the Paris Agreement. Six developing countries have already submitted FRELs/FRLs and undergone international evaluations; this year, 10 more countries will enter undergo FREL/FRL evaluations. However, factors such as reference scales (national/sub-national/verification project level), scope of activities (including control of deforestation/forest degradation and sustainable forest management), and measurable carbon pools/time periods differ from country to country. We are now faced with difficulties in terms of the extent to which each country will adjust and improve FRELs/FRLs for the post-2020 framework; this is a technological challenge to be addressed in order to ensure consistency regarding FRELs/FRLs for the future. Currently, 60 countries are carrying out preparation activities for REDD+; they are in different phases of progress. This is not a linear process that is finished once the system is in order; rather, it proceeds gradually, repeating a cycle of constant adjustments, integration, and improvements. The timing of funding at each phase is also important, and it is necessary to construct effective funding mechanisms by combining various financial resources from both government and private sectors. Furthermore, if there is no change, there is no progress. To achieve progress, it is necessary to change people’s thinking. REDD+ is a framework for “changing people’s thinking.” Accordingly, change is possible with this evolution. Finally, with regard to the future of REDD+, the aim is to contribute to the reduction of GHG emissions based on the Intended Nationally Determined Contributions (INDCs) voluntarily submitted by many developing countries. Approaches such as the preparedness status for REDD+, methods, and order of priority differ across countries, but their objective is the same. Thus, cooperation and harmony are possible. REDD+ is also the best option for governments to consider comprehensive and sustainable land use plans. Going forward, many countries will proceed from the preparation phase to the implementation phase, and it is important to consider the extent to which consistency among different implementation scales can be ensured at an early stage of planning. The Paris Agreement emphasizes the necessity of calculation rules and reporting for emission reductions in order to secure governmental support and transparency in each country. The agreement also highlights the importance of funding mechanisms and markets to promote the agreed-upon framework in the future. 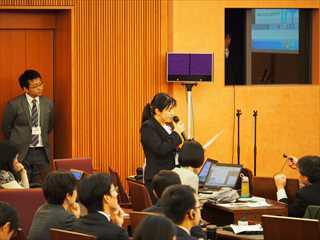 A Q&A session was held with Ms. Yasuko Inoue of the Forestry Agency of Japan acting as the moderator. In response to a question about the ways in which developed countries should provide support for REDD+ preparation activities, Dr. Sanz-Sanchez said that REDD+ began as a framework in which all developing countries could participate, but in reality, there is an imbalance in targets of support from donor countries. Furthermore, the recent emergence of signs of assistance fatigue is a concerning problem. Through preparation activities, developing countries need to shift from external funding to their own national budget. However, reducing GHGs is a never-ending endeavor, and it was pointed out that skewing support toward certain countries poses the risk of creating different problems in other countries. In addition, Dr. Sanz-Sanchez was asked for her opinion regarding new business schemes supplementing public funding. Though they are necessary as a source of funding for REDD+ implementation, the private sector is concerned that carbon markets are not functioning sufficiently. In response, Dr. Sanz-Sanchez said that the role of markets in the implementation phase, in particular, is important, but insufficient by itself. She emphasized that it is necessary to consider appropriate combinations of government and private sector funding; further, she stated that multi-sector cooperation is required. It is desirable that private companies participate proactively in pilot activities. Further, innovative business models should be constructed. The World Bank manages two funds (worth approximately 1.6 billion dollars) and supports various REDD+ activities with the aim of reducing GHG emissions through a sustainable landscape approach, reducing village poverty, and realizing food security. The World Bank’s business model includes support for REDD+ preparation activities. This means strengthening functionality, such as improving policies and implementation systems through Forest Carbon Partnership Facilities (FCPF) gratis funding. Once a suitable environment is established, funding support is provided for verification activities at the project/administrative district level. Further, results-based finance is provided according to Emissions Reduction Purchase Agreements (ERPAs). Currently, 54 countries are undertaking preparation or verification activities at the national level, and 14 of these are planning larger semi-country/administrative district pilot projects. Activity content spans multiple sectors (i.e., agriculture, energy, transportation, land use planning, mining, and forestry), with the World Bank endeavoring to take a comprehensive approach. To elevate activities to the national/sub-national level in the future, it is imperative to have healthy governance and political leadership coordination among sectors and the involvement of interested parties at each level. Agreement and coordination regarding profit distribution systems that incorporate local communities must also be achieved. The role of technology is also important, and continuous support is necessary to establish and diffuse measures. In addition, using the World Bank funds as a lever, a funding source for long-term, results-based payment must be secured by building a mechanism that combines funds from donor countries and other sources, such as private-sector investments. Mr. Lotsch responded to a question regarding the conditions for results-based finance for reducing GHG emissions after receiving World Bank funding assistance. The reversion of carbon credit ownership rights was also addressed. He explained that in the case of national efforts, as a part of REDD+ preparation activities, the implementing country must show it has the administrative capacity to enact legislation for converting emission reductions and carbon absorption into credit and transferring rights. In addition, with regard to carbon credit ownership rights, although it is impossible to make generalizations, the Prototype Carbon Fund includes both supporting country funds and private company investments, and distribution methods are decided through discussions at the time the ERPA is concluded. REDD+ FRELs/FRLs are important as indicators for REDD+ activity results-based finance and for measuring the results of domestic forestry industry policies. They also indicate a country’s level of contribution to climate change mitigation. Specialists conduct a technological evaluation of each country’s FRELs/FRLs after they are submitted to the UNFCCC. Subsequently, each country reports their REDD+ implementation results to the UNFCCC through biannual reports. However, details of financing based on verification and results are undetermined. Under the UNFCCC, countries are required to ensure consistency between domestic GHG inventories, but only basic items are prescribed for setting FRELs/FRLs. These include: (1) definition of “forest,” (2) data to be used (e.g., year and number of samples), (3) calculation subjects (e.g., activities, carbon pool, and emission sources), and (4) setting approach. FRELs/FRLs vary tremendously depending on how each of these points are considered. For example, those submitted by Brazil only target deforestation, and calculations do not include emissions from forest degradation. The FRELs/FRLs submitted by Indonesia do not include non-CO2 emissions (e.g., CH4, N2O) from peat fires. However, these discrepancies will be resolved going forward through gradual revisions of the levels. There are also other issues concerning FRELs/FRLs, such as whether or not emissions caused by the application of manure are included, inconsistencies between sub-national and national units, and the evaluation of the appropriateness of future predictions based on current models. Additional future issues with regard to the complete implementation of REDD+, such as carbon prices related to payments based on results, domestic distribution methods, and prevention of double-counting, also exist. Indonesia set emission reduction targets of 26－41% by 2020. REDD+ is regarded as the most important measure for reducing emissions in the land use, land-use change and forestry (LULUCF) sector, which produces the most emissions. For this reason, setting FRELs/FRLs is an important factor in the construction and implementation of REDD+. Indonesia submitted REDD+ FRELs/FRLs to the UNFCCC in December 2015. The FREL/FRL target activities included deforestation and forest degradation; for carbon pools, aboveground and underground biomass as well as soil organic carbon were included in the calculations. The adopted approach is to calculate emissions resulting from changes in carbon accumulation amounts caused by deforestation/forest degradation and peat decomposition. Activity data are based on public land cover classification maps at the national level for a total of 23 categories (seven forest and 16 non-forest area categories). Emission factors were calculated based on data for national forest inventory fixed sample plots. Using this data, annual emission amounts from 1990 until 2012 were estimated, and FRELs/FRLs were set using mean values. Emission amounts up until 2020 were estimated separately. Under the present circumstances, reliable data for emission amounts for non-CO2 gasses (e.g., CH4, N2O) released in peatland forest fires were not prepared; given the high degree of uncertainty, these figures were not included in the FREL/FRL calculations. Issues for the future include ensuring consistency of FRELs/FRLs at the project level, province level, and national level; improving the reliability of the data mentioned above; calculation of non-CO2 emissions from peatland fires; and cooperation/coordination among relevant organizations. Cambodia aims to strengthen domestic forest policies and contribute to sustainable forest management through REDD+ activities aimed at preventing deforestation and forest degradation. To this end, Cambodia is promoting national REDD+ policies, NFMSs, and FREL/FRL efforts as REDD+ preparation activities. In particular, preparations are being carried out with the cooperation of JICA in relation to SISs. FRELs/FRLs are set using a top-down method at the national level; they are currently awaiting government approval. These will be submitted to the UNFCCC in February 2016, in time for the FREL/FRL technological screening planned for 2016. For FRELs/FRLs, carbon accumulation amounts are calculated based on land use maps (LANDSAT) for 2006, 2010, and 2014; average values are used in these calculations. Only deforestation is evaluated. The calculation method uses mean values rather than past trends to set more conservative FRELs/FRLs, based on limited data. In the future, FRELs/FRLs are to be reviewed every four years and accuracy is to be improved by including other activities such as forest degradation. An issue, however, in setting FRELs/FRLs is that national and REDD+ forest definitions and categories differ. The Democratic Republic of the Congo (hereinafter abbreviated to “DRC”) is currently developing FRELs/FRLs ahead of the next COP. Methodology is characterized by the fact that the DRC has large forested areas in comparison to other countries. Therefore, as an interim measure, attempts are being made to develop sub-national FRELs/FRLs for three provinces comprising 51% of the country’s total area. The target provinces have high forest coverage and face extensive deforestation. In setting FRELs/FRLs, deforestation was evaluated in 1990, 2010, and 2014. In order to improve accuracy, attempts are also being made to incorporate data from other years and evaluate forest degradation, which is another serious source of emissions after deforestation. Emission coefficients are set using data from the National Forest Inventory. For the National Forest Inventory, forests in the three target provinces were classified into four forest types, and sampling was carried out. Existing equations developed by Chave are used for the allometric equations, and it is important that research on the effectiveness of this approach be carried out in the future. In response to a question regarding what kinds of steps would be taken to improve FRELs/FRLs in the future, Ms. Widyaningtyas of Indonesia and Mr. Leng of Cambodia replied as follows. Indonesia has an improvement plan with regard to activity data. What is important when undertaking improvements is coordination between government ministries and agencies. In recent years, the relevant ministries and agencies agreed to create a comprehensive map for the acquisition of more reliable data. With regard to emission coefficients, existing data have already been collected to a certain extent, but Indonesia plans to continue improving survey methods through human resources training. In contrast, methods for obtaining data on peatlands, which are a large source of emissions, are an issue. The key to obtaining reliable data is answering the question of how to develop and promote forestry sector policies-including REDD+, among all national policies in a well-balanced manner. Cambodia faces the challenge of dynamic land use changes. Therefore, the current use of land use maps has only three reference points for calculating FRELs/FRLs; therefore, the only choice is to set conservative levels using average values. To improve this system, it will be necessary to prepare activity data for more points. In addition, use of high-resolution images, rather than LANDSAT, is being considered. Regarding emission coefficients, National Forest Inventory (NFI) has not yet been implemented, but demonstrations are expected to begin in 2017. Accordingly, and after 2021, it will be possible to identify carbon accumulation amounts using the stock change method rather than the current gain-loss method, thus enabling more reliable data to be obtained. The inclusion of a section on financing in the Paris Agreement shows the importance of private sector financing in REDD+ funding. Furthermore, expectations are high that REDD+ will expand as an offsetting option in the carbon market. However, when the private sector implements REDD+ activities, consistency at the project level and national/sub-national levels becomes an issue. As a means of ensuring this consistency, Verified Carbon Standard (VCS) has established the “Jurisdictional and Nested REDD+ (JNR)” standard. Methods include three options: (1) set explicit FRELs/FRLs in accordance with jurisdictions, breaking up activities into projects; (2) use FRELs/FRLs specific to projects in accordance with rules complying with national FRELs/FRLs and make adjustments; and (3) use jurisdictional FRELs/FRLs as is. However, there are advantages and disadvantages to each of these methods. In the case of (1), it is easy to evaluate the performance of projects within a jurisdiction, but model predictions are complex and may call for discussion. Method (2) has clear guidelines but requires adjustments for different scales. In the case of (3), although the method is simple, it is difficult to evaluate the performance of each project. The Paris Agreement states the importance of the private sector and the expectation that it will continue to promote project activities in the future; however, the issue of ensuring consistency in the project and national/sub-national levels is accompanied by risks. At the same time, there are risks in terms of jurisdiction. As a countermeasure, it is desirable that mechanisms be created for each sector to cooperate, such as the ones that clearly show their relevance to INDCs. A question was asked regarding how funding should be combined and invested at the national and/or project level. 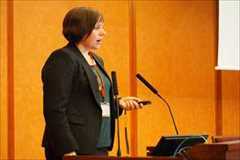 In response, Ms. Swickard explained that significant activities differed for the various levels involved. She noted that countries implement activities, such as safeguards, at the national level, whereas activities aimed at local residents are implemented at the project level. In addition, it is essential to consider what kind of funding should be used for investment in each activity; it was pointed out that further discussion is required going forward. The Japan Forest Technology Association has been involved in setting FRELs/FRLs for various countries through JICA projects. One piece of wisdom gained though this experience is the impression that, although FRELs/FRLs are set at different scales depending on the country, not only scaling up but also scaling down can be used as a means of ensuring consistency. For example, Vietnam has set various scales for FRELs/FRLs, but trends differ greatly between provinces. For this reason, it is necessary to consider how FREL/FRL scales should be set so as to achieve appropriate profit distribution. Furthermore, it is predicted that after 2020, there will be arguments regarding the need for continuous improvements and monitoring after FRELs/FRLs have been set. Thus, the creation of systems enabling the central and regional governments to cooperate in order to obtain data becomes important. In Vietnam, the central government renews land usage maps once every five years, but provincial governments renew maps every year with the cooperation of rangers at the community level. It is essential that the two types of maps be used in a complementary manner. In India, variances can be seen between central and regional government data, and resulting issues remain. Since 2011, the Kanematsu Corporation has been carrying out REDD+ verification activities using Japanese government grants in the Boalemo Regency in Gorontalo Province, Indonesia. Project participants also include the Boalemo Regency Government and Panasonic Gobel Group. Activities include measurement reporting and verification (MRV) and the promotion of cacao cultivation as an alternative livelihood to the driver of deforestation, slash-and-burn agriculture for corn cultivation. At the provincial level, maps already prepared were used, and FRELs/FRLs evaluating deforestation were established. With regard to promoting cacao cultivation, training aimed at cultivating high-quality cacao is provided, and a value chain has been established with a Japanese chocolate manufacturer. It is assumed that deforestation resulting from slash-and-burn agriculture has stopped since the project’s introduction in 2011; further, by 2030, an estimated 86,520 t CO2 eq will have been prevented from entering the atmosphere. In the future, it is expected that the Boalemo Regency project level will scale up to the Gorontalo Province sub-national level using the same MRV system. The Joint Credit Mechanism (JCM) REDD+ Project was launched in 2014 in a village (HK-VC) in the Phonxay District of Luang Prabang Province, Laos, under the auspices of the Ministry of the Environment of Japan. Following a JICA project implemented as REDD+ preparation between 2011 and 2013, this project is aimed at full-scale REDD+ implementation. Project activities focus on the incorporation of agricultural techniques and other livelihood activities in order to stop slash-and-burn farming, which is the driving force behind deforestation in this region. Resident participatory carbon monitoring and FREL/FRL settings are also being carried out. Initially, local residents were expected to become aware of the effects of deforestation countermeasures through carbon monitoring, leading to the promotion of forest preservation. However, in some areas, livelihoods were limited to slash-and-burn farming, making it clear that consideration needs to be given to not only carbon emissions but also local characteristics, such as the regional dependence on slash-and-burn agriculture. Accordingly, an office where local residents can easily undergo counseling has been provided. In addition to carbon monitoring, it was decided that monitoring through the project in terms of REDD+ activities and resident participation should be carried out as well. Plans are to scale up the FRELs/FRLs from the village level to the district/provincial level. In doing so, it is anticipated that differences in costs and activities between areas will impact FRELs/FRLs. For this reason, FREL/FRL scaling methods must be considered if monitoring is to be continued. With regard to the case example of Laos, a question was asked concerning local cooperative relationships in terms of gathering information from local residents and setting, as well as scaling up, FRELs/FRLs. First, with regard to gathering information, it was explained that a local residency system was introduced based on Sweden’s experience, and an information gathering system that can be scaled up in the future is being constructed. However, with regard to FRELs/FRLs, it is difficult to identify carbon accumulation amounts, making it difficult to scale up; therefore, methods are being considered for evaluating activities at the district level and establishing FREL/FRLs at the province level. There was also a question about whether activity data or emission coefficients were more difficult to match when scaling up. Mr. Suzuki replied that because activity data change more dramatically, it is more difficult to achieve consistency with such data. 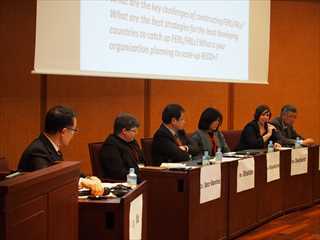 Mr. Yazaki said that using data prepared by other countries does not present much difficulty. The following three topics were given as panel discussion themes, and each panelist chose one of the optional themes and expressed an opinion. How do you evaluate the positioning of REDD+ under the Paris Agreement? Furthermore, how do you evaluate REDD+ under the INDC and what is your opinion of its future direction? Is the supply of REDD+ funding by international organizations sufficient? What are the issues in setting FRELs/FRLs? Dr. Sanz-Sanchez led by praising the positioning of REDD+ under the Paris Agreement, saying that it clarified the positioning of REDD+. One such example is enabling contributions to climate change countermeasures in the forestry sector considering a broader perspective over a longer timeframe. 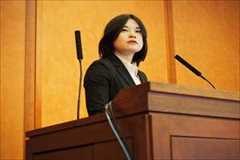 She stated that future management would not only be required in the forestry sector, but also at the landscape level. She also praised the fact that the Paris Agreement had focused on funding, which until now had been lacking in REDD+. She further pointed out that REDD+ funding is insufficient and that a diverse range of funding sources, including from the private sector, is required. She noted that to secure such funding, methods for procuring private sector funding and ensuring profits need to be considered. In response to a question from the audience regarding upfront payment (for preparation/implementation activities), Dr. Sanz-Sanchez explained that a gap had developed between upfront payment for verification activities and results-based payment. However, as mentioned in Mr. Lotsch’s presentation, FCPF is now making payments for the entire process, from implementation to results. Mr. Shishido of JICA introduced REDD+ preparation activities in Vietnam supported by JICA, expressing that REDD+ funding is being supplied by international organizations. He also mentioned the importance of private sector funding. In particular, he noted the importance of addressing livelihood activities of the local community driving deforestation in order to ensure the sustainability of REDD+ activities. Private sector investment will be essential. Furthermore, as an example of cooperation between the private sector and civic society in Japan, Mr. Shishido introduced the “Japan Public-Private Platform for REDD+” (hereinafter referred to as the “Platform”), for which FFPRI and JICA jointly act as Secretariat. Ms. Widyaningtyas, first of all, praised the Paris Agreement for clarifying the roles of developing and developed countries. She also expressed her expectations that in the future, as REDD+ preparation activities continue, developed countries will keep investing in REDD+ activities. Next, she added that, although funding from international organizations is sufficient, there are issues concerning how funding is distributed within the recipient countries. Finally, she emphasized that data transparency and consistency are issues for setting FRELs/FRLs. In response to a question from the audience concerning whether or not to consider forest fires when establishing FRELs/FRLs, Ms. Widyaningtyas explained that measures were being implemented to ensure reliability with regard to fires and their related emissions. Ms. Swickard expressed her opinion regarding funding from the perspective of the private sector. First of all, she pointed out the importance of creating mechanisms for different activity scales and cooperation among a diversity of actors. She also addressed the possibility of investments from the private sector being used as funding for creating such mechanisms. In addition, as an outlook for the future, she proposed that REDD+ be interpreted on a broader landscape level. The greatest driver of deforestation/forest degradation is the agriculture sector; therefore, issues should be tackled on a broader scale and not limited only to the forestry industry. There was a question from the audience regarding crosscutting of profit distributions. Ms. Swickard pointed out that, in addition to the issue of profit distribution from the national/sub-national level to the project level, credit trading in INDC at the national level also needs to be considered. The question of what incentives are possible for motivating developing countries to trade with other countries is one that requires discussion going forward. Dr. Hirata spoke about the reliability, screening, and utilization of FRELs/FRLs; he stated that the key to the success of REDD+ is the trust level of participants. He explained how, in the case of Cambodia, the definition of “forest” had changed, causing forest areas to also change, thus creating difficulties for ensuring continuity and reliability. 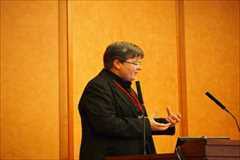 In addition, he compared the two options of scaling up and scaling down. Scaling up is difficult, for example, when adjustments are required at the project level as different FRELs/FRLs among multiple projects are established. In contrast, when scaling down from the national level, project performance could be evaluated at the minimum level. Last, Dr. Hirata expressed his expectations for full-scale implementation of REDD+ in the future. When considering FRELs/FRLs, two lines are considered: a “predicted value line” in the case that there is no project, and a “measured value line” for emissions, indicating a project scenario. It is believed that project operators set measured value lines, or project targets, based on project funding costs. In doing so, operators need to be conscious in the future of how effectively FRELs/FRLs can be utilized. The Forestry and Forest Products Research Institute (FFPRI) and REDD Research and Development Center Director Mitsuo Matsumoto summarized the content of each of the presentations made during the seminar. His closing remarks described the history of REDD+, suggesting that the methodology thus far has not progressed in a straight line but has moved forward despite repeatedly “going back and forth.” In closing the seminar, Dr. Matsumoto expressed his expectations that the seminar will also provide opportunities for “going back and forth” and moving forward simultaneously toward implementation of REDD+. He also stated that relevant discussions will continue. Reducing emissions from deforestation and forest degradation and the role of conservation, sustainable management of forests and enhancement of forest carbon stocks in developing countries (REDD+) has been discussed under the UN Framework Convention on Climate Change (UNFCCC) for 8 years since this mechanism was recognized as a climate mitigation option for the post-2013 framework at COP13 held in Bali in 2007. Subsequently, COP19 adopted the Warsaw Framework for REDD+ which includes the technical guidance for REDD+ implementation and the agreement to start the work programme on the results-based finance. Based on these agreements, several actions have been taken to initiate results-based payments under the UNFCCC. The Green Climate Fund considered a system for the results-based payments from 2014 through 2015 and the UNFCCC Standing Committee on Finance discussed forest finance including REDD+ at the 3rd forum held in September 2015. Along with these initiatives, some countries have already submitted their forest reference emission levels and/or forest reference levels (FREL/FRL) to the UNFCCC Secretariat. 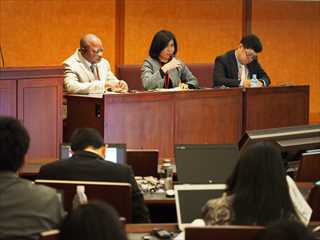 REDD+ therefore started to gear up toward full implementation. Under the UNFCCC, FREL/FRL is defined as a benchmark for assessing each country's performance in implementing REDD+. In a broader sense, FREL/FRL is related to the evaluation of each country's contribution to mitigate climate change through forest activities. For the estimation of FREL/FRL, each country needs to consider national circumstances, such as forest definition, historical trends of GHG emissions, drivers of deforestation and forest degradation, and land use and forest conservation policy. FREL/FRL should be transparent, complete, consistent and as far as possible accurate. The interpretation of FREL/FRL provides lessons to deal with technical challenges of estimating and integrating FREL/FRL. Such understanding provides insights in guiding effective ways to support REDD+ implementation, and designing effective global actions to mitigate climate change. Along with the REDD+ activities at the national/subnational levels under the UNFCCC, a number of local REDD+ projects have taken place under voluntary schemes. The use of reference levels is also crucial to account for the emissions reduction at the project level. This gives rise to a new challenge of clearly defining the relationship and consistency between FREL/FRL at the national/subnational levels and project level. For the post-2020 framework, activities related to land use, including REDD+, are expected to play a major role among the mitigation and adaptation measures. The objectives of this seminar are 1) to review and share the past and present of REDD+, including international negotiations up to COP21 and the submitted FREL/FRL, and 2) to discuss the post-2020 REDD+ strategies, particularly on the relationship between the FREL/FRL at the project level and national/subnational levels.